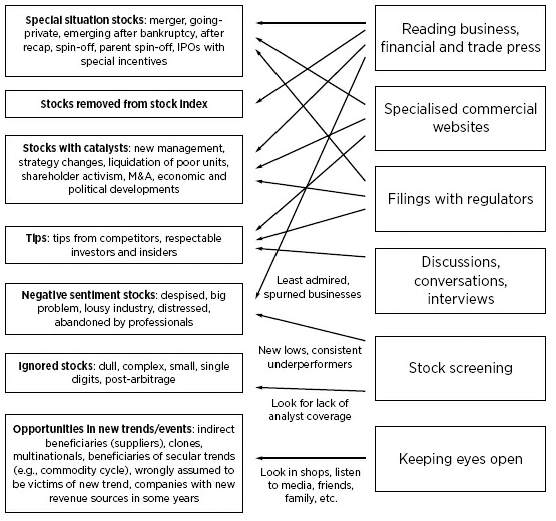 Successful investors usually have a systematic approach to finding stocks to invest in. Today we’ll look at the different methods that they use. The objective is to discover stocks that are mis-priced, typically trading well below their intrinsic value (or above intrinsic value for shorting). Today we are going to focus on the process of finding bargains in developed markets. 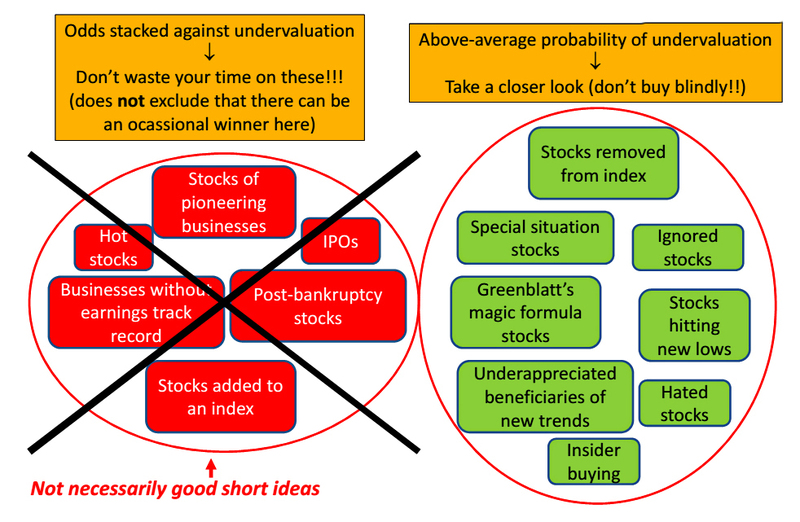 In the next post in the series, we’ll look at the types of stocks to avoid, and at good stocks to short. The book also discusses how to find bargains in emerging markets. Since I don’t advise buying individual stocks in foreign markets, I won’t cover this section. These are likely to be mis-priced, but are equally likely to be undervalued as overvalued, so careful analysis is required. These are well-known stocks that have received bad publicity. Herding, extrapolation and loss aversion lead to investor over-reaction. Investing in these stocks is called turnaround investing. New trends and industry booms are often well-publicised before they hit, and their effects should be discounted in stock prices. Stocks that are penalised too much – some companies that are expected to suffer from a trend will be over-punished. Indirect beneficiaries of new trends – some companies (usually suppliers to the booming industry) will not be recognised as beneficiaries because the link is unclear. Clones of a successful innovator (Microsoft of IBM, Wal-Mart of Kmart). Multinationals with high exposure to emerging markets. Beneficiaries of long-term secular trends – investors are generally too focused on the short-term, and can overlook things like long-term (c. 18 years) commodity bull markets. Most stock tips should be ignored, and even when you accept them as a source of ideas, you should nevertheless DYOR (Do Your Own Research) to confirm them. The problem with catalysts for a share price recovery is that if everybody knows about them, they should be already priced in. liquidation of an unprofitable division. These stocks “benefit” from forced selling that pushes down their stock price. All funds that use the index as a benchmark – and index funds and ETFs that track the index – must sell the stock. The under-performance will usually come before the expulsion, and can be profitable purchased very soon afterwards. the market is better at evaluating numbers than qualitative characteristics, and companies with great corporate culture, management, brands etc. can out-perform. lists like “The 100 Best Companies to Work For”, “100 most valuable brands” etc. can help here. when American Express span off Lehman Brothers, the volatile earnings of the bank made it hard for investors to work out the future earnings of American Express, so of course they erred on the low side.